Spring is almost here in South Florida! Soon the water temperatures will start to warm up and the seas will calm down which means locals can get back into diving. Another great reason to get out on the water and go diving is its sea turtle nesting season, which means divers will most likely encounter more sea turtles underwater. Sea turtles that nest on Florida beaches will do so at night, and during the day they rest on the reefs and wrecks that sit offshore. If you dive in the Palm Beach County area you are likely to see numerous loggerhead sea turtles asleep in the fields of sea fans and sea whips on the backside of the reefs. One thing to remember as divers is all sea turtles are protected in state waters so any harassment, touching, or take is prohibited. 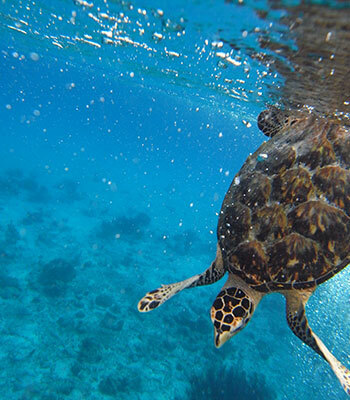 So what’s the best way to view sea turtles underwater? Sea Turtles that are sleeping are doing so because they are getting their energy stored for the next time they come out of the water to lay their eggs. So if you encounter a resting sea turtles, keep your distance and respect their space to not startle them. If a diver encounters a sea turtle feeding, again keep your distance, you don’t want to be the reason the animal stops feeding. Stay back and observe this neat behavior, take note on what they are feeding on. You would be surprised the different diets that each sea turtle species has. If a sea turtle is about to swim by you, the best thing you can do is control your buoyancy by stopping in the hover position and contain your excitement. The sea turtle will most likely swim by calm and slow so you can have a great encounter, but if you flail your arms or swim/chase after them they will be out of your sight quicker than the Looney Tunes Road Runner. What if you encounter a sick or injured sea turtle underwater? Again all sea turtles are protected in state waters; only people who hold permits are allowed to handle sea turtles. So how do you get ahold of such people? The first people to call are our local FWC officers; they have a 24-hour hotline. Make sure to report your observation and it would be best to have a GPS coordinate for them. Another option would be to contact Loggerhead Marine Life Center or Gumbo Limbo. Both hold permits to handle sea turtles and have great facilities to assist these animals with additional hospital care if needed. How can you help sea turtles from getting sick or injured? First thing to note is one of the favorite foods of a sea turtle is jellyfish. Leatherbacks are especially fond of them. A huge problem divers see underwater is lots of floating plastic, especially shopping bags, which can look like a jellyfish. If ingested the sea turtle can become very sick. A way to prevent this is by switching to cloth shopping bags. If you must use plastic then to make sure they are disposed of properly. Another problem we see underwater is fishing line left behind on the reef. Sea turtles feed and rest on our reefs so they could easily become entangled in fishing line. So how can a diver help? Carry a cutting tool on your BCD and cut any fishing line away from the reef and bring it up to dispose of. You would be amazing the amount of marine debris divers can pull up from just one dive, which in the end saves marine life. Divers are the eyes and ears to our underwater world; it is up us to do what we can to protect the things we love to dive with. For more programs about sea turtle conservation and research contact your local Force-E Scuba Center during Sea Turtle Month or the good people at Loggerhead Marine Life Center and Gumbo Limbo.